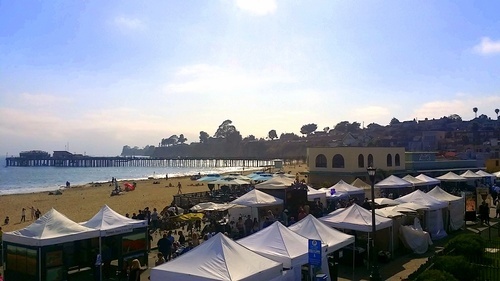 The Capitola Art & Wine Festival combines Art, Wine, Music and Food, all in charming Capitola Village overlooking the beautiful Monterey Bay. Over 150 fine artists and 22 Santa Cruz Mountain wineries will participate in this year’s Festival. Be sure to visit the Local Artisans Marketplace where you will find unique and locally made artisan foods and crafts. A Kids Art & Music Area with ongoing craft projects and musical play is conveniently located in the center of the Festival on Lawn Way. Enjoy great entertainment all weekend including local dance groups, street performers and live music. The Capitola Art & Wine Festival is a juried show of original fine art, open to artists of all mediums to apply. Application deadline is May 1, 2018. Admission FREE! Fee for wine tasting: Purchase a 2018 Festival Glass ($12) and tasting tokens ($1 each) at a Glass & Token Booth. Tastings vary between 2-4 tokens.